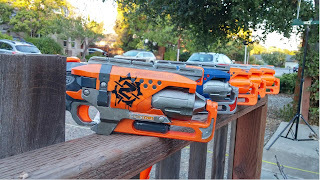 Bay Area Nerf: Why A Hammershot? Why do so many people love these lil' guys? Recently the Hammershot has come under fire as not being a “good” secondary. Although there are many fans, I still feel that it’s worth explaining the reasoning behind my choice of sidearms. It’s my go-to secondary for a variety of reasons. While I make no claims that the Hammershot is “the best” secondary, it is still quite effective and an excellent all around choice. 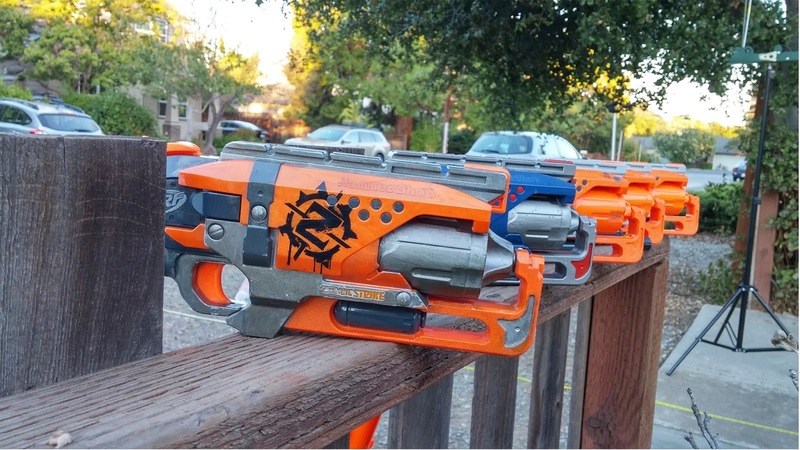 So read on dear taggers, and learn why the Hammershot is the jack of all trades, master of none. Let me start off by giving you some of the requirements I had when choosing a secondary, and why I wanted one in the first place. For me, a secondary served as a quick go to if I run out of ammo, or my blaster jams in the middle of a firefight. Note that while these are MY reasons, they are by no means the ONLY reasons to carry a secondary. As with everything you choose, I believe you should be well informed. Play to your strengths and set yourself up with the tools and equipment to accomplish your goals. It had to fit into a holster. That was key, probably my biggest requirement. I’m a little guy, and I needed something that I could put on my hip and run with that didn’t flop around. I’m not a fan of drop leg holsters, I wanted my secondary to be right at my hip, attached to my belt. Next I wanted something I could fire with one hand. I generally don’t wear a sling. Why? First, have you seen the sling attachment points on a stock Alpha Trooper? I’m not a fan of the sling attaching to the priming bar. I like to change from left to right hand easily, depending on the corners, and I like to dart push. I also don’t normally run a stock. I enjoy the shotgun feel as opposed to the full rifle. I didn’t need the stock to prime with a factory spring, and the accuracy wasn’t laser sighted to where I’d have to shoulder and take careful aim. So if my blaster was out of commission, I didn’t want to drop it. I wanted something I could fire with one hand. I could reload my primary by tucking it beneath an arm and holding the mag with my offhand. With my secondary still in my main hand, I could reload mags. It wasn’t pretty or ideal, but I could do it. So one handed operation was key for me. I wanted something that was front loading. Running anything larger than a 6 round mag makes a blaster pretty hard to holster, and I wanted to be able to reload my secondary on the fly. Dropping a mag, and filling it takes a lot of time and effort that I didn’t want to be necessary for a secondary. You essentially need two hands. One to hold the mag, then the other to reload. With a front loader, I could load up even while the blaster was primed and ready to go. Finally, I wanted a blaster that used the same ammo as my primary. In our games, there’s no special rules for other ammo (aside from vortex discs in which ricochets count). There’s no melee, or shields to break, so there was no reason for me to run a secondary ammo type. In my opinion that was just another thing that I had to figure out how to carry on me, and make a spot for. If no one else was using it then whatever I brought to the field would be fired toward the other team, and if I ran out I’d have an empty blaster. Slam-fire was something I didn’t need or want in a secondary blaster. It meant using two hands, reduced accuracy, and burned through what would undoubtedly be a limited ammo capacity of my sidearm. In fact, anything that was spam heavy wasn’t something I was interested in. I knew that my shots would be limited, and reloading wouldn’t be as quick as a mag, so I wanted to be able to control my shots. Now recall when the Hammershot first came out, pre-Sweet Revenge, even. There were very few other blasters that really fit the bill. Only one I could find was the Snapfire 8, but you had to get creative with holstering, and the trigger pull was something I didn’t enjoy at all. Since then there’s been a plethora of hammer style blasters and choosing any of them makes sense to me. The phrase “Buy a Hammershot” has always rung as a catchall term for hammer prime blasters to me. Some people prefer the Sweet Revenge, or 4X4, and that makes perfect sense. Still, there’s plenty of other sidearms that players can choose from. Those all work well doing other things, often times better than the Hammershot. The Hammershot just brings together the bits of each of them I like. I don’t run my sidearm to fill a niche, some people do. There’s a wide variety of opinions, likes and dislikes, strategies, and play styles. There is no “right” or “wrong” sidearm. I’ve tried other sidearms, but none have felt as natural to me. The same idea goes for my EAT. I get some flak for rocking it occasionally, but it’s what I want. The mag is where it feels like it should be, the priming mechanism works the way I want a blaster to. That’s something that’s important to me. I don’t need the fastest, or furthest firing blaster on the field. That’s low on my priority list. Comfort and feel is a large part of what I strive for in my load outs, and my equipment is no exception to this. Yet others should be encouraged to take advice but make things their own, diversity is part of what makes things on the field so much fun.